Good morning! Today I am going to highlight breakfast on my new diet! If you haven't read about my new carb cycling diet, you can get all the information here. On this diet you eat within 30 minutes of waking up and every 3 hours after that. So because of my wake up time, I sort of feel like I eat two breakfasts. I eat my first meal between 6-6:30am and my second between 9-9:30am. I have struggled a bit to find something to have for the first meal. I don't want to have to prepare anything that early in the morning. Our house is very small, so I don't want to make a lot of noise and, to be honest, I am just not a first thing in the morning cooker! I have tried overnight oats. I really like some of the recipes I found online, but none of them fit into this diet plan. I have to include protein in each meal. So I was trying to make my own overnight oats recipe using protein powder mixed in. Last week I had two days where I just couldn't get the consistency right and I gave up and tried a cereal, which also was a fail for me. This week, I tried a different kind of fruit in the oats and nailed the consistency, but I still couldn't stomach it. I am bummed because it is just such an easy breakfast, but I think I really don't like the protein powder flavor in it. I might try one more time next week with chocolate protein powder and see?? Maybe?? So, instead this week, I am going to have cottage cheese with pineapple mixed in for my first breakfast. This is easy, no prep and I like it ok as long as I have a piece of pineapple in every bite! But, I had it yesterday and I was hungry again so soon. So this isn't the final answer!! For my second breakfast I am eating a delicious egg white omelet! They are super easy and I really like them on both my high and low carb days. Here are my tricks to making them super easy and delicious! First I use these egg whites, so simple! The first day I actually separated 4 eggs. Not going to happen every day, so then I smartened up and bought this! On the first day of the week that I made the omelet, I took an extra 5 minutes to cut up all the veggies instead of just enough for that omelet. I cut up some of the peppers really thin and cut up some onions and I am storing those in one bowl for the omelets. 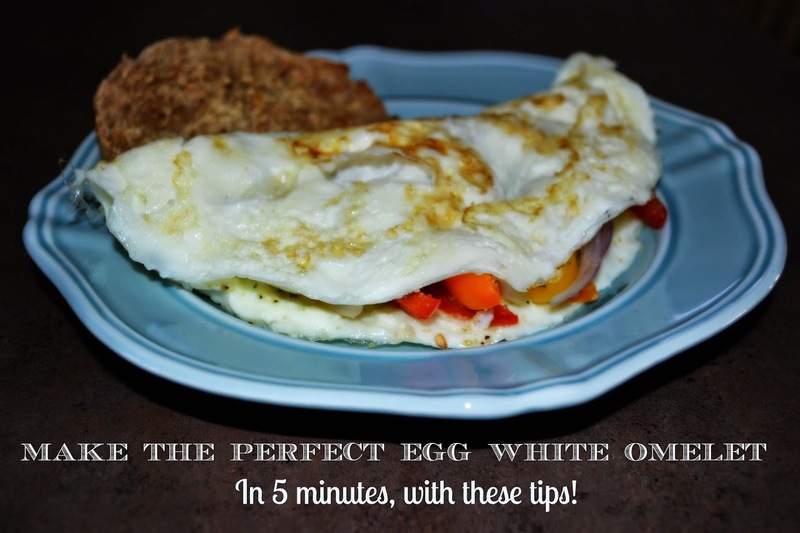 This makes the omelet super easy to throw together because there is no chopping! Here is how I make the omelet. Spray a small pan with olive cooking spray. Poor 3/4 cup egg whites (4 egg whites) into the heated pan. Let cook a few minutes. After the egg whites have cooked for a bit and the top of the omelet looks partially cooked, I use a rubber spatula to pick up the sides and move any remaining liquid underneath. I never flip the omelet. I do this until there is no more liquid, then I top half of the egg with the ingredient's. Cook for another 30 seconds of so, fold it over and put it on my plate! The whole thing takes maybe 5 minutes. I made an omelet for myself and one for my husband today in 11 minutes! You can't beat that for a super healthy breakfast!! Must be a carb portion and a protein portion and can include veggies, nothing else! Can't wait to hear some of your ideas! Linking up with Jen for WIAW! Love it! I just learned how to make an omelette recently, so I will have to try an egg white omelette now. Stopping by from WIAW. I like greek yogurt and fruit, but not sure that's too close to your cottage cheese trial. what about an almond flour muffin made with splenda and protein powder added in, veggies on the side or a protein shake with almond milk, veggies on the side? Oh I would love a muffin! I will have to look into a recipe that would work! Great idea! Thanks!